Ripper Fiction Book of the Year! Ripperology awards two books in their Book of the Year competition among the Ripper Community. This was the first year a Fiction Award was presented and Live and UnCut has won the inaugural Fiction Award. This is a huge honor, to be recognized by historians and Jack the Ripper enthusiasts who embraced the book and voted for it. Considering the book was out of publication since June that is a massive achievement! As the Axford stories move toward submission to publishing houses this was the perfect icing on a wonderful cake that has been Live and UnCut’s journey. Joined The Star Chamber Podcast for a post Bouchercon review. Hosted by Stephen Zimmer, Michael West and Daniel Dark. I also recounted having Daniel visit and stay with us. Always a fun chat, I am on this for the first 20 minutes but check out the whole episode as the talk with rising horror film maker Tory Jones was class. For four days, there were different blogs posted that were either hosted or shared by Redjack. I wrote an opinion piece regarding Jack the Ripper in fiction. Here is the link to Redjack, with a Translate option. Here is the Redjack Blogathon OP I wrote for them. Today I was honored to be chosen to present at the New Authors Breakfast at Bouchercon. Bouchercon is a massive mystery lovers conference featuring some heavy hitters in the genre and many readers, hoping to meet their idols or the next big thing. The New Authors Breakfast featured approximately 40 authors like myself, who were all given 2 minutes each to pitch their work. With the assistance of on Daniel Dark, the pitch definitely got their attention. I have news…….and this time, it’s “MEGA”. I will be appearing on the Horror and Suspense = Local Author Panel at MEGACON as well as book signings afterwards. I have attached a link below. All friends local to the Tampa Bay area, this looks like a huge conference with some big celebs turning out. One in particular I will be hoping to meet during the event. Lock in Sept 21-23. This one’s going to be epic! I will be appearing on FOUR panels at the Imaginarium Convention in October. Below is a graphic promoting the panel appearances, please note the days and times. The final panel appearance I will actually be the moderator. I met Trey through a reviewer website and Live and UnCut sat on his TBR for a long time. He’s a very busy man. Finally, he reviewed Live and UnCut and I both love and appreciate his feedback. Jack the Ripper: Live and UnCut has been selected as a Finalist in the Imadjinn Awards for the Best Mystery category. The Awards night will be at the Imaginarium Conference on October 6th. Will let you know how it goes. All Imadjinn Finalists can be found here. The latest round of questions from Suzie Ballinger, who runs the “Books Reviews and More” website. Monroe Starr was happy to read and review Live and UnCut on her website, as well as conduct an interview. I really enjoyed her questions. 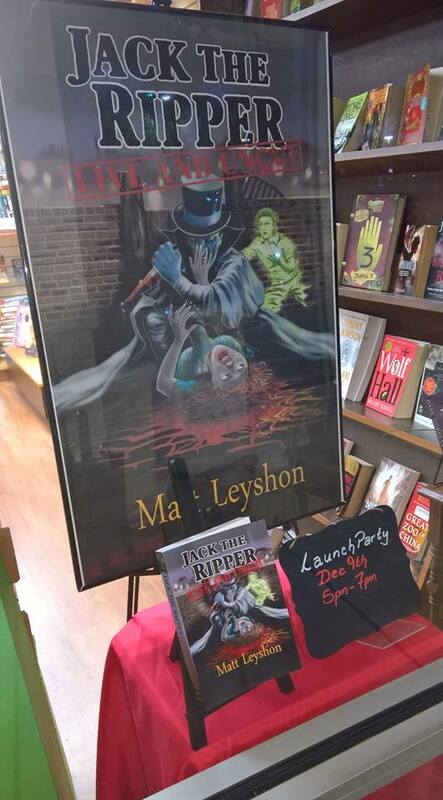 “Leyshon certainly adds his own elements to the Ripper case, intertwining fiction and non-fiction, which I found fit really well together. I promise this book does not disappoint. He sheds light on the women who lost their lives and the pain that came with it, despite their positions in life or how they were viewed by society. She’s back again. Christina has uploaded a review clip, giving her assessment of Live and UnCut. Another review posted online today. This is from Carmen, aka “The Tranquil Reader”, who speaks favorably of Live and UnCut as well. Live and UnCut was featured again on one of Christina’s clips. In her clip “Top 5 Insanely Addictive Books” the book received a favorable mention again. On her popular channel “CTinaLoves2Read” Christina gives her ?Mid Year Freak Out” in which she answers listener questions. I was listed as one of her favorite new authors in this clip and she also claimed Jack the Ripper: Live and UnCut has the best looking cover out of her entire library of books! Amanda is an Australian true crime author, fiction writer and celebrity true crime expert, with her specialty being serial killers. She has a wonderful podcast “Monsters Who Murder” as well as being a regular on Studio 10. She has interviewed some of the most infamous killers on the planet and has the nickname “Serial Killer Whisperer”. I can now place this seal anywhere regarding Live and UnCut. On the cover of the book if need be or any promotional material for it. I think it looks good wouldn’t you say? I was featured on the lovely Bryony Leah’s Blog . She reviews books and helps promote authors like myself. I was featured on Abby’s Blogfor Anne Bonny Books, a website that reviews books and helps promote authors like myself. AWARDS ANNOUNCEMENT……and YOU CAN VOTE!! It is my pleasure to announce that “Jack the Ripper: Live and UnCut” is competing for an Academy Award!! No, not Oscar, but this is the Author Academy Awards. I am competing in the genre for “Best Thriller”. The big difference with this Award is YOU can vote! Please click on the link below and vote for the book. Thrillers are in category 10. Please Share this link in the hope of seeking further votes/support. Voting will continue for 3 months, and the other books have a good head start on me. I am confident though that this book can catch and pass them. It is with immense pride that I reveal that Jack the Ripper: Live and UnCut has a chance at two awards for “Jack the Ripper Book of the Year”! In the first group the book of the year has both fiction and non-fiction books combined, which makes it tough. That is the criteria for the award and it is understandable. The other award however does separate fiction and non-fiction, which make things interesting. It is a great honor be listed for both awards. I honestly didn’t anticipate a warm reception from what I perceived as the demographic most likely to criticize it. Now the book is where it is today and I no longer have a fear for putting the book out there, confident many other readers will enjoy it as well. I’m very excited to announce that I will be attending another convention, and this one is in my backyard! Bouchercon 2018 in St Petersburg, FL, September 6th -9th. This is a mystery and crime fiction convention and I am really looking forward to it. It will be a terrific opportunity on many fronts. I will be hopefully participating in a panel discussion or two (TBD). Once I know the topics and times, I’ll post them on here for those who may be attending. Of course, I will also be there promoting my book and hopefully will have updates regarding the new installment in the Axford/Limbo mystery series.. This looks like a great convention and I am thrilled to be a part of it, especially being so close to home. Thrilled to announce that I will be attending the Imaginarium Convention in Louisville Kentucky, in October this year. I will be participating in a few panel discussions. Once I know the topics and times, I’ll post them on here. The prospect of meeting Daniel Hooberry, Holly Marie Phillippe and Stephen Zimmer and getting to know them better over a few days is also very exciting. I had an absolute blast at Rippercon. There were some terrific presentations, met some wonderful people and also had a great time as a panelist on the Ripper Fiction Panel. Learned a lot and made some new friends which I hope will extend years beyond Rippercon. An incredible experience and also gained some new readers and hopefully fans. The Ripper Fiction Panel. Bernard Beaule, Janis Wilson and myself. YES!! 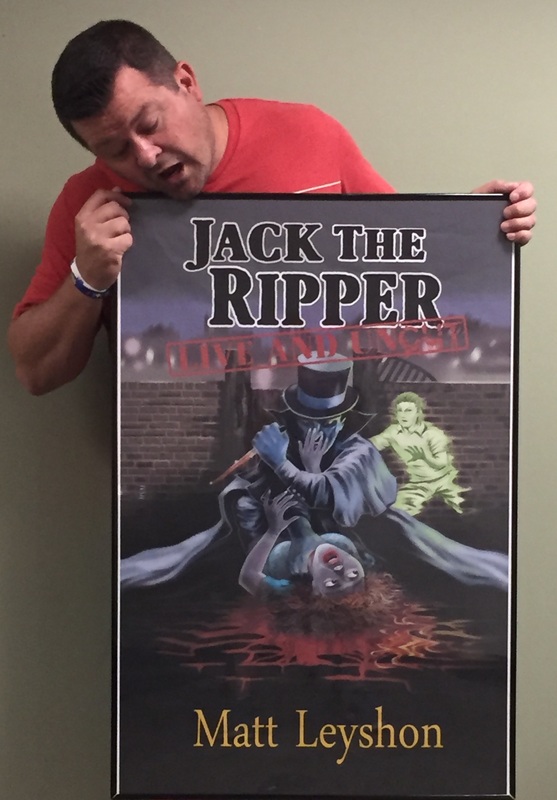 I will be attending Rippercon, The Jack the Ripper- True Crime Conference this year (April 6th-8th). I’ll also be appearing as a panelist on the Ripper Fiction discussion as well as being totally in my element, among people with similar interests, but know a lot more than I. Will be meeting some good friends in person for the first time as well. A huge opportunity to network and can’t wait to sit in on the panel and I’m extremely excited. It is with great pleasure, and pride that I unveil the new cover for Jack the Ripper: Live and UnCut. Finally, this mainstream thriller finally has the cover that fits.Very excited. Had a wonderful time appearing on The Star Chamber Podcast. Hosted by Stephen Zimmer, Holly Phillippe and Daniel Dark. I already knew Daniel but had not spoken to Steve and Holly before. A great way to spend part of your Valentines Day, chatting about your passion with some creative kindred spirits. Had a terrific chat with them, a lot of fun, and they were good enough to let me plug the book. They were very welcoming considering I was a caller, turned co-host. Lots more to come where these guys are concerned. I can tell. Totally abandoning my promotional lull to appear as a guest panelist on Rippercast. This episode was dedicated to discussing Jack the Ripper in fiction as well as our respective approaches to researching and writing a fiction work with Jack the Ripper in it. On the panel were Bernard Beaule, Daniel Dark, Michael Hawley, Jana Oliver and myself. Hosting the show were Jonathan Menges, Iain Wilson and Ally Rider. It was such a great discussion! 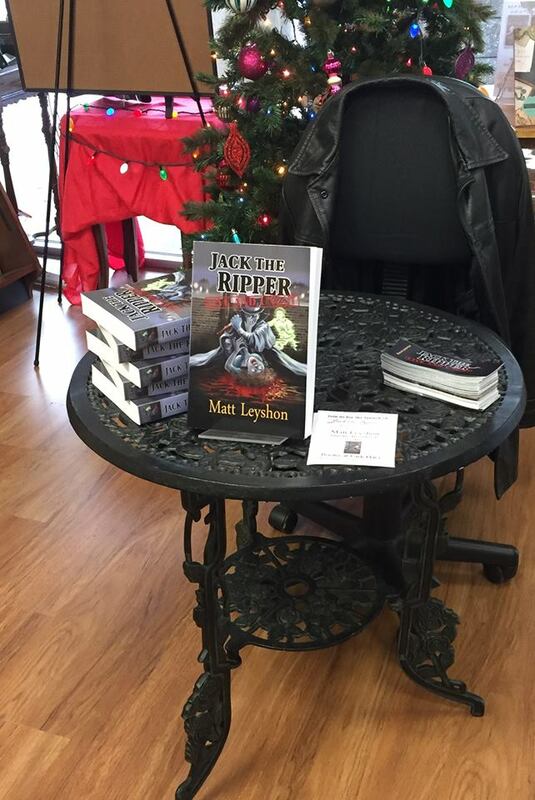 I think there were many take aways from the chat but I think the most significant one that shone through for me was that there ARE fictional authors who care about representing The Ripper well in fiction and we research a lot. And another 5 star review! This one is from Alessandro at @BlogRedjack. The book has now branched out into Italy! That is 4 out of 4 Ripper Publications giving Live and UnCut a very enthusiastic thumbs up. This review is in Italian but has the option on the Page to translate the Review into English. Very humbled. Thank you Alessandro. A huge honor and a Merry Christmas indeed. Thanks Ricky, I look forward to the full review. Had a great time again at Books at Park Place, signing more books and getting to know some fellow authors. Thanks again to Mark and Nancy at Books at Park Place. 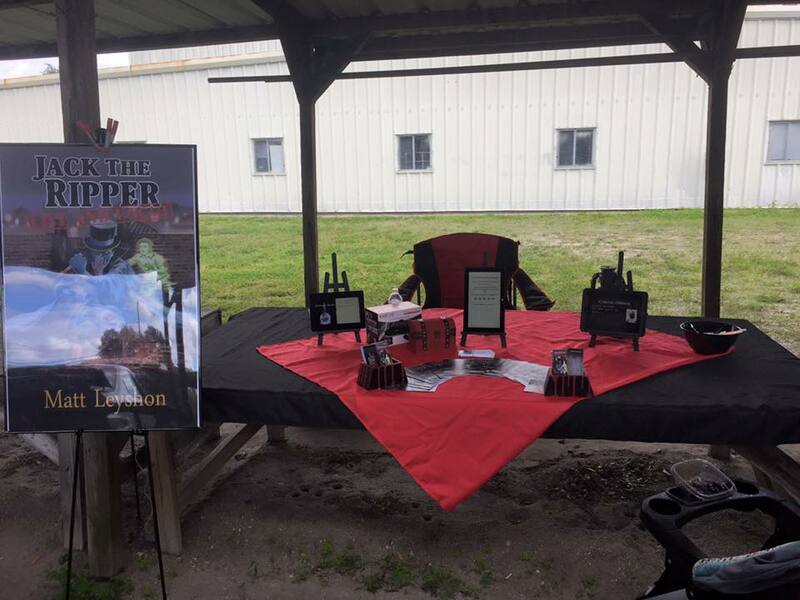 This was the Steampunk Holiday – Multi Author Event with members of the Tampa Bay Steampunk Society attending. Made some new friends and have remained in touch with a couple. A special shot out to Elise Kova, who was very accommodating and willing to chat with a new author like myself. Her advise has been paramount to my becoming a better author outside of my book. The creation of this very website was one of her tips. Thank you Elise. My FIRST BOOK SIGNING!! I was beyond excited to host my first in store book signing and was privileged to have collaborated with Mark and Nancy at Books at Park Place. to make it happen. 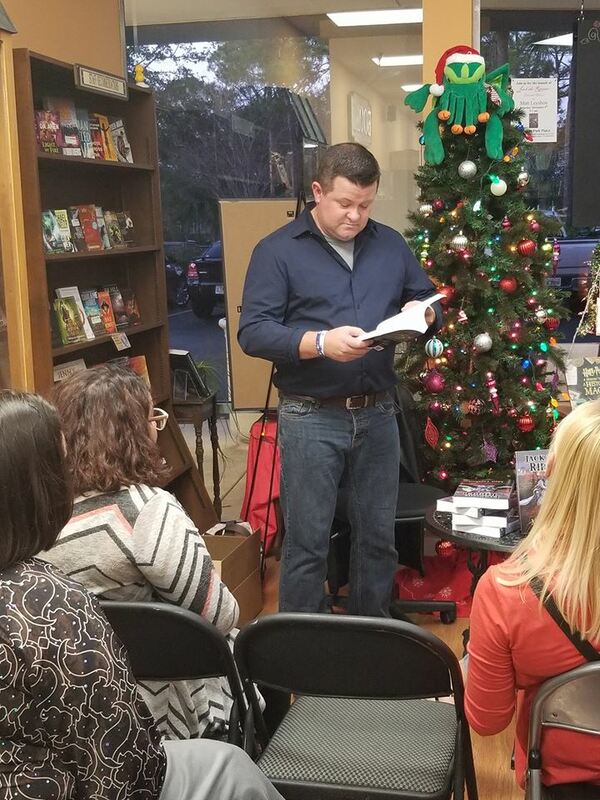 A decent turnout with some readers getting their own copy as well as a reading from me. Thank you to all that came out and made this such a special night for me. I feel like a proper author now. I was also asked to do an interview for the magazine, extremely rare for a fiction author. It was an honor. I am finally feeling like this book may actually be something decent. Jack the Ripper: Live and UnCut is now available in Paperback! Very excited. It is now available at Amazon and Barnes and Noble. A very special announcement. Yes, Jack the Ripper: Live and UnCut is available or purchase in Kindle, Nook, Apple and other eBook formats. My first major review and it’s a 5 star one. Samantha Hulass at The Whitechapel Society have given Live and UnCut a terrific review and she is definitely a fan. I wasn’t sure how this book would be received by The Ripper Community but this is exactly the start I was hoping for. My first public appearance as an author and already I am unorthodox. I attended the Book Fair in Clearwater, host by Wordier Than Thou. I say unorthodox as I had a table at the book fair and had no book to sell. I did have plenty of tools to use to have an effective display. Definitely some people interested in the book, one may lead to my location of my first book signing. Time to get a book to compliment this fine table. June 26 – WE HAVE A FIRST DRAFT!!! They say a picture tells 1,000 words. This one represents just over 100,000. At the age of 6 my first grade teacher was the first person to tell me “keep writing stories”. It’s encouragement I’ve received ever since from many people. What this picture represents is my completing the first draft of my first novel. You can’t see much around me, as it’s 2:30am at the time it was taken, but I am sitting on the edge of a pier at Little Harbor, FL, drinking champagne and about to call the first person, my mother, to let her know I was done. There’s still plenty of work ahead of me, and I will be staying here a few days to work on it, but I cannot describe the relief in finally reaching the milestone of completing a first novel. I am extremely grateful for the support I have had to this point both prior to this book and during it’s creation. Especially from Susan and the kids who know I went down a very deep and dark rabbit hole of research to write this. There were many late night, just like this one. More info about the book will be coming out shortly for those who are interested. Just wanted to let people know who have been supportive of my writing and wanting to see an end result, it’s coming!